The Ultimate 2560 Fluid Head & 60L Tripod from OConnor includes the Ultimate 2560 fluid head package, 60L two-stage tripod system with a Mitchell top plate and a floor spreader. The fluid head is capable of supporting camera payloads up to 66 pounds at a 6" center of gravity above the platform, and offers a ± 90° tilt range. The fluid head package comes with a 12" pan handle with 30° bend and 11.5" pan handle extension. It also comes packaged with both a Mitchell base and 150mm ball base with tie-downs for expanded tripod compatibility. The 60L tripod weighs just 9 lb and has a double extension design that is safe and stable while carrying payloads up to 209 lb, even at its maximum height of 60.6". 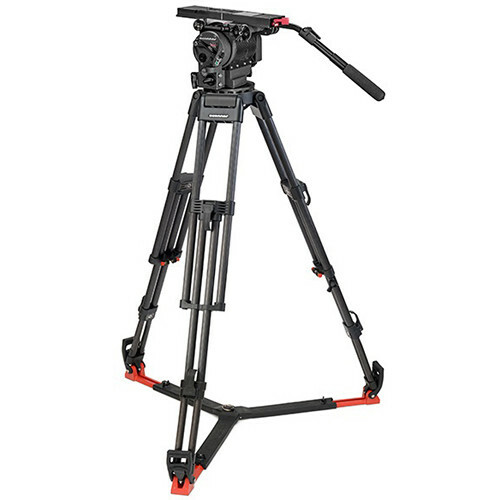 This lightweight tripod with Mitchell top plate collapses down to 29.9" for easy transport. The floor spreader holds the tripod legs in position, providing rigidity and stability to the overall system. The Ultimate 2560 Fluid Head Package from OConnor is designed for use with the current crop of digital cinema cameras. Weighing less than 18 pounds, 2560 is capable of supporting camera payloads up to 66 pounds at a 6" center of gravity above the platform, making it well suited for cameras such as the ARRI Alexa in a portable configuration or any lightweight digital cinema camera in a full studio configuration. The head comes packaged with both a Mitchell base and a 150mm ball base adapters with tie-downs for expanded tripod compatibility. It also comes with a large Euro-style quick release for rapid mounting and dismounting of large camera rigs, a pan handle, and a pan handle extension. Crafted for cine-style shooting, the head design delivers cinema standard positioning of controls, including brakes and rosettes, for easy and intuitive use. The 2560 fluid head also features OConnor's patented sinusoidal counterbalance system for accurate balance at any point in the tilt range. In combination with the step-less, smooth pan and tilt fluid drag, the 2560 delivers control and stability for digital cinema shooters. The OConnor 60L 2-Stage Carbon Fiber Tripod Legs with 150mm Bowl support tripod heads that have a 150mm leveling ball. The legs feature 2-stages and weigh only 9 pounds; however, they can support 209 pounds and extend from a minimum height of 22.8" to a maximum height of 60.6" when using the available mid-level spreader. Each leg extends or retracts independently and when detached from a spreader each leg can pivot without affecting the other legs. This is especially useful when working on rough or uneven terrain. The Mitchell plate incorporates a leveling bubble, allowing you to level the legs with or without a head attached. The dual spikes at the end of each leg provide extra grip when working on soft ground and the design of the spikes also provide a solid mounting surface for the optional rubber feet/spike protectors. The legs are designed for use with an available mid-level spreader for stability on uneven terrain. It also features OConnor's Smart Quick clamping system that provides a visible clamp lockdown. A small accessory hook under the Mitchell plate allows you to hang various available tools and items such as a walkie-talkie, tape measure, or even a foam rubber pad for shouldering the legs during camera position changes. The legs support over 200 pounds of head and accessories, allowing you to mount a heavy-duty fluid head and accessories. The legs feature spiked feet that provide solid purchase in soft surfaces when not using a spreader. The independent leg spread and height adjustment allows you to use the legs on oddly shaped areas as well as steps. The Floor Spreader for 30L / 60L Tripod from OConnor is a floor spreader designed for use with an OConnor 30L or 60L tripod. The floor spreader is also compatible with all Sachtler 100 and 150 bowl tripods (excluding the DA 100 K, DA 150K, and Cine). Box Dimensions (LxWxH) 16.6 x 15.9 x 15.9"
Box Dimensions (LxWxH) 35.3 x 9.5 x 9.4"
Box Dimensions (LxWxH) 15.55 x 6.85 x 5.6"